This post is in partnership with Crest, but all opinions are my own. Before I begin this post, I want to come right out and say that I am not a fan of making New Year’s resolutions for myself. For years, I would feel immense pressure to come up with resolutions that were focused on changes that required big commitments (permanently give up all sugar, work out for an hour every single day, meditate for an hour daily, etc. ), each of which fell apart quickly and left me feeling disappointed and guilty. I noticed a pattern with my resolutions – they were almost always health-based (which is great!) but they didn’t translate into sustainable lifestyle changes (which kind of defeats the purpose). Eventually, I let the concept of resolutions go all together, but this year, I wanted to revisit them in a different way. So on January 1st (my birthday), I wrote down attainable changes I wanted to make with a whole person lifestyle approach (body, mind, and spirit) in 2018. I then broke them down into small, concrete daily tasks that, together, could (hopefully!) make a profound difference. And today, I’m sharing them with you. 1. Eat an apple a day. This change is more metaphorical than anything else, but building on the old aphorism “an apple a day keeps the doctor away,” I am eating one healthy fruit or vegetable every single day, no matter what. Obviously, the ultimate goal here is to eat lots of whole, nutritious foods everyday – but by focusing on eating one piece of fruit or a veggie, I can avoid excuses (“I don’t have time to make anything today” or “I’m on the go all day so I have to grab something fast/easy like a packaged bar”) and just make it happen. 2. Drink a (reusable, of course) bottle of water a day. I’m actually pretty good about drinking water, but I’m not consistent about it. I might go for weeks where I refill and consume my water bottle a dozen times a day, and then go for a week or two (especially in times when I’m busy like the holidays or our move into a new home last week) where I approach dehydration because I genuinely forget to drink anything all day. This year, I am committing to drink one bottle every day, no matter what. While I plan to drink much more than that, drinking one bottle is easy to remember no matter how frazzled I am. 3. Cook 3 dinners a week at home. I’ll admit it guys, I am a take-out queen. My years of city living pre-kids created a bad habit revolved around take-out menus, and I’ve never been able to let it go. I enjoy making creative snacks, but when it comes to meals, the time and effort involved often feels overwhelming. I’ve also never been good at shopping for staples or meal prepping, and therefore tend to spend more money on groceries to prepare meals than on just ordering out. That said, it isn’t a secret that cooking meals at home is the healthier way to go, so I am committing to making 3 dinners a week in my kitchen. Ultimately I’d love for that to progress to 6 dinners a week, but we’re focusing on small, easy changes here – so for now, 3 it is. 4. Take care of my mouth by taking care of my gums. I’ve always been good about brushing and flossing my teeth, but this year, I decided I wanted to take things further and focus on my gums as well – something that I feel is an important part of the whole body/person changes I’m making. As soon as I learned about the recent launch of new Crest® Gum Detoxify TM toothpaste, I grabbed some, and it was such an easy think to add to my daily routine for 2018. I really love how it is specially formulated with Activated Foam technology that reaches below the gum line (an area that even we champion brushers wouldn’t be able to reach!). Pretty great right? 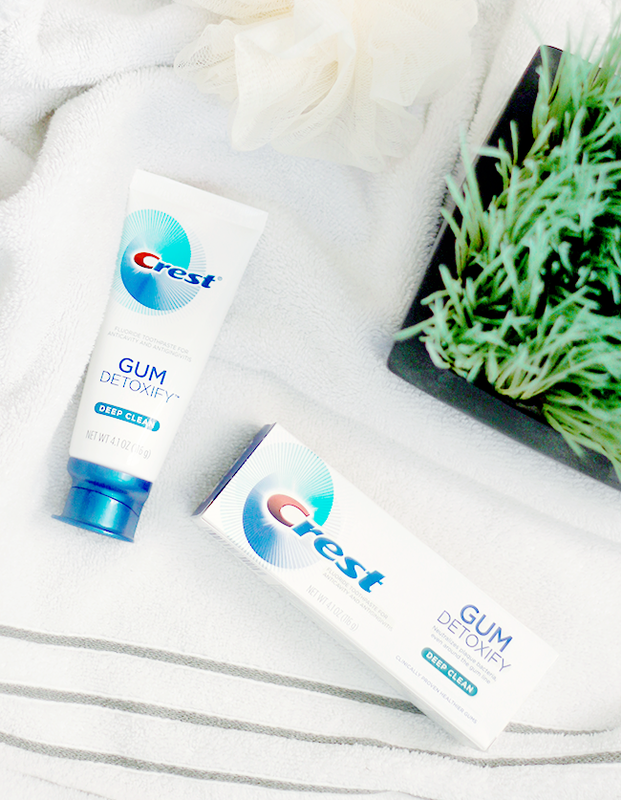 I’m personally loving the Deep Clean variety, but Crest® Gum DetoxifyTM toothpaste is also available in Extra Fresh, Gentle Whitening, Two-Step, and is available in drugstores, mass retailers and eCommerce sites nationwide, starting this month. 5. Practice 5 minutes of mindfulness a day. A little over a decade ago, I spent 3 years living and volunteering at a Tibetan Buddhist Center where meditation sessions were at my fingertips. I remember feeling an incredible sense of calm and peace, being able to walk next door and take part in them. 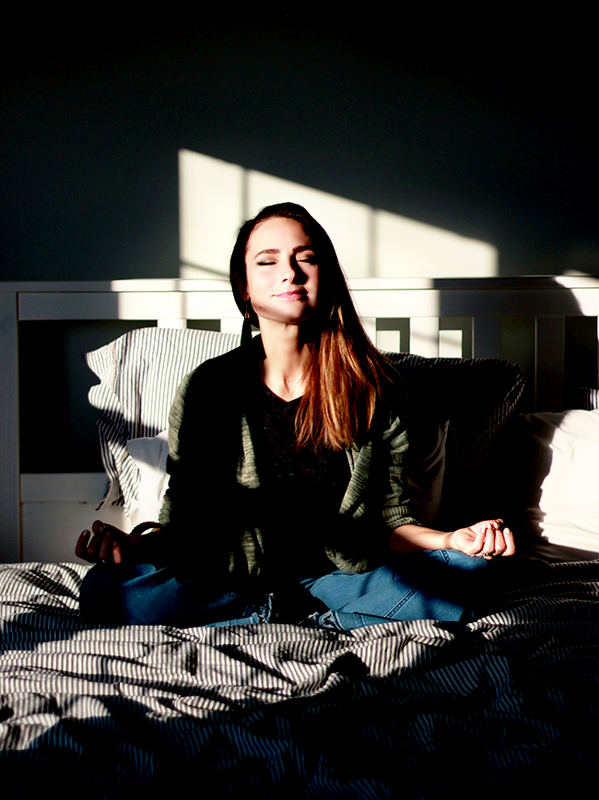 These days, I live in a regular old house in the suburbs and have two young children, and my attempts at daily meditation have proven close to impossible. This is honestly one of the things I end up feeling guiltiest about not being able to complete, because I know what a difference it makes in my overall health and mental state. So in 2018, I am committing to 5 minutes of mindfulness every day, either first thing in the morning or before I go to bed. The concept of mindfulness is more realistic for me than actual meditation (although when I can make time for it, I absolutely do that as well), because it just involves being present and observing your thoughts, feelings, bodily sensations, environment, etc., and can be done almost anywhere. I have really been enjoying this, and even with my commitment to 5 minutes, am already feeling a positive change. 6. Set aside 30 minutes a day of family time. The last 2+ months of 2017 really burned me out, and I barely saw my husband or kids. Because Robbie was mostly on break from the band’s tour schedule and could care for our little ones, I worked 60-80 hour weeks. I needed to do this to help support my family for the first few months of this year when Robbie would be gone often, but looking back, there could have been healthier ways to approach my schedule. I truly believe that spending quality time with loved ones is the most important thing you can do for your emotional well being, so in 2018, I am setting aside at least 30 minutes a day, every single day, to focus 100% on my family, in ways where we can just enjoy each other’s company without distractions. It’s still early in the year, I know, but so far, these smaller lifestyle changes are working. My fingers are crossed that they continue to be successful throughout the year and beyond! Are you a resolution person, or do small, simple daily changes work better for you? What changes are you working to make in 2018?